Every DBA at least one time faced ORA-02055 exception. It may be occur on several reasons. Here is symptom and reason. I will not some of them and when and why we use it. Please note, it depends of the Oracle version and release. catalog.sql - create data dictionary views. catpart.sql - creates data dictionary views for the partitioning table. catprc.sql - creates data dictionary views for types, stored procedures, and triggers. catreps.sql - installs pl/sql packages for snapshot functionality. Also keep in mind some script may call inside another script(s) and so on. Using srvctl utility on ORACLE 11g we can stop, start and check status of RAC. If you requested to stop RAC database follow steps:. Above guide for Oracle 11g R1. Till Oracle 11g R2 OCR and VOTE resides out of ASM, starting R2 it locates under ASM, so stopping cluster -all will be shutdown clear. Especially thanks to my friend, to Mahir for correcting and advice. 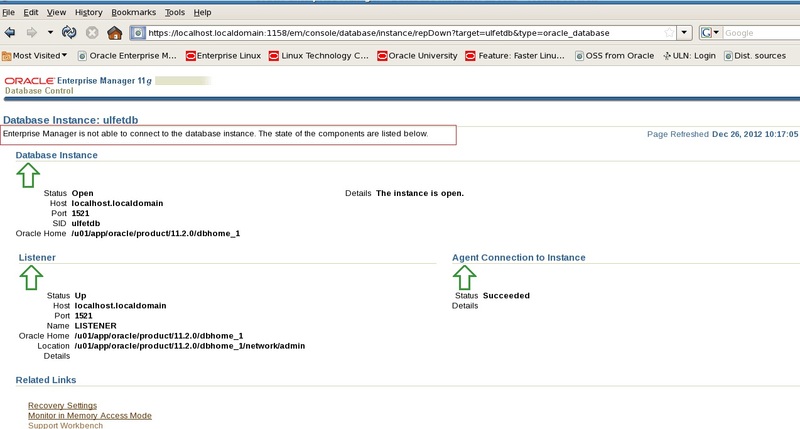 Oracle 11g Enterprise Manager is not able to connect to the database instance. Today I try to open EM and monitor DB. 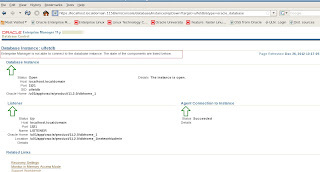 Unfortunately it was failed and show me "Enterprise Manager is not able to connect to the database instance. The state of the components are listed below." Authentication passed but it does not work. If problem on authentication check sysman user`s account status. INFO: This operation is being logged at /u01/app/oracle/cfgtoollogs/emca/ulfetdb/emca_2012_12_26_10_19_50.log. Management Repository has been placed in secure mode wherein Enterprise Manager data will be encrypted. The encryption key has been placed in the file: /u01/app/oracle/product/11.2.0/dbhome_1/localhost.localdomain_ulfetdb/sysman/config/emkey.ora. Please ensure this file is backed up as the encrypted data will become unusable if this file is lost. Alternatively you can directly drop repository and then create it again using below commands. Sometimes some database object(s) stays invalid (there is a lot of reason: modification object, compiling new procedure, function, package (depending exists) etc). Easy method is compile @$ORACLE_HOME/rdbms/admin/utlrp.sql or detect invalid objects and recompile it. But it is dangerous every time to use utlrp, it is recommended to use utlrp when upgrade db version ex : 9 > 10 > 11 (also release upgrade). Because while upgrade process DB is not available to use for end user. But if invalid object count is not big and not a few you can use below single SQL and compile result of it. Also you can create PLSQL anonymous block and compile it. I want to create database link on base a database. It means link from database to itself. --Now try to create database link via hr user. A database link connected to a database with a different name. The connection is rejected. create a database link with the same name as the database the database it connects to, or set global_names=false. Global_names parameter indeed true on my database, lets change it. Drop database link which created before. What else if global_names`s TRUE and I try to create db link with same same of SID ? To prevent this kind of error rename global name. DB link created, bu still does not work. Now update global_name`s again and check db link. How to find which SQL statement generates lots of redo logs. But, what about if you want to see amount of undo blocks and undo records accessed by the transaction? One of the best feature for Oracle 11g is setting result cache. Result cache reside in Shared Pool area in SGA. Now database can serves result for queries from the cache instead of re-execute query again and again. But when depending database object is modified cache result stays invalid. Using result cache you can improve performance of your query. It is reduce I/O, sorts, computations. New initialize parameters RESULT_CACHE_MAX_SIZE and RESULT_CACHE_MODE exists on Oracle 11g. You can enable/disable result cache using RESULT_CACHE_MAX_SIZE parameter. If value of RESULT_CACHE_MAX_SIZE = 0 it means this feature is disabled. Memory allocate for the result cache is taken from the shared pool. There are three different modes you can use and they are managed with RESULT_CACHE_MODE init parameter. This parameter is dynamic and can be changed with ALTER SYSTEM and ALTER SESSION. Default is MANUAL. Using result_cache hint you can use to manually cache a result of query to override the default setting of there parameter in a session level. Also there is has no_result_cache hint. Lists various server result cache settings and memory usage statistics. Lists all the memory blocks in the server result cache and their corresponding statistics. server result cache along with their attributes. Lists the dependency details between the results in the server cache and dependencies among these results. Stores cache settings and memory usage statistics for the client result caches obtained from the OCI client processes. For now result cache is clear, let`s cache query result. I will use result_cache hint override the default setting of parameter in the session. and at the end I will compare explain plans and execution times. Now check another table`s statistic. 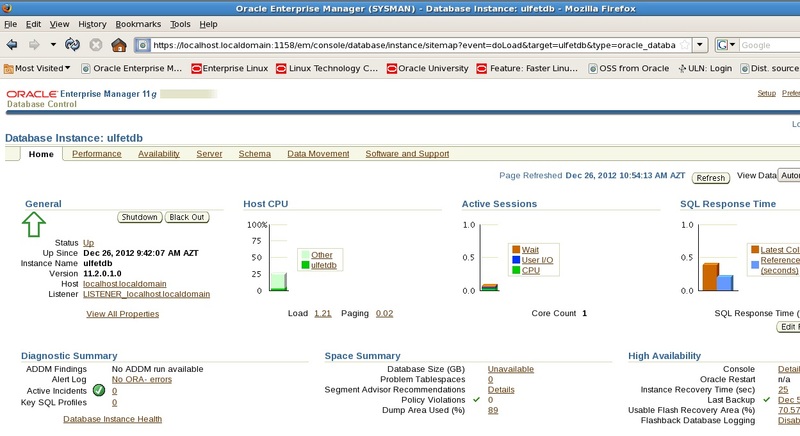 As you see Oracle use Shared Pool (before used SQL query) but it is not affected as result cache feature. Result cache provide us data (result of query) from memory and not read it from file. But it`s expensive, you can compare above query`s explain plan and can easy see the different. Using EXPDP take dump from higher version and import into lower version. 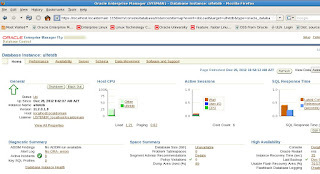 As you know EXPDP utility firstly was introduce in Oracle 10g. This is enhanced EXP/IMP utility (with additional features, example transport tablespace). Let`s create directory on Oracle 11g database and give read, write permission. Now I will connect as ulfet user and will create new table and insert into one record. Time to take export of table using DATAPUMP. --Take dmp file to Oracle 10g`s db server and use same utility DATAPUMP`s IMPDP. --To be sure directory works properly. I will create same directory on 10g. CREATE TABLE "ULFET". "TEST_TBL" ("ID" NUMBER, "NAME" VARCHAR2(10)) PCTFREE 10 PCTUSED 40 INITRANS 1 MAXTRANS 255 NOCOMPRESS LOGGING STORAGE(INITIAL 65536 NEXT 1048576 MINEXTENTS 1 MAXEXTENTS 2147483645 PCTINCREASE 0 FREELISTS 1 FREELIST GROUPS 1 BUFFER_POOL DEFAULT) TABLESPACE "REC_TBS"
--There is error. Tablespace is different. To prevent such error use remap_tablespace option. --But what will happen if user omit version=10.2 during export/import. --Export will work normal as usual but while import data you will face exception such as ORA-39142. ORA-39142: incompatible version number 3.1 in dump file "/home/oracle/oracle/product/10.2.0/db_1/admin/mydb/dpdump/test_tbl2.dmp"